Those of you who know me know in my spare time I write code, build solutions for things, etc. I like having a few “pokers in the fire” as the saying goes so I can bounce from side project to side project in case I get stonewalled and need a break. I’ve had a Raspberry Pi 2 Model B board laying around for a couple of years and couldn’t decide what to build with it. Many ideas crossed my mind but nothing stuck…until this past week. Another side interest of mine has always been Astronomy. Back in 1999 I joined a project at UC Berkeley called SETI (Search for Extra-Terrestrial Intelligence). Part of their project included a grid-computing effort that would process information from radio telescopes around the world and look for narrow-band signals, which amidst the regular noise of space waves are not known to be produced naturally. The machines on the grid-computing side would process the results and send them back to UCB for review. Several years after the project took off there was discussion about the SETI program losing funding and shutting down, so I stopped participating. Just recently the thought occurred to me…perfect use for the RPi! This spawned the idea of SLRPi – SETI Listener for Raspberry Pi. Sure the Seti@Home folks have an application for just about any platform you can install on your desktop or mobile device and participate, but I wanted my challenge to be to start from a blank Debian environment and build it from the ground up. No installers, no easy packages, just raw development from scratch. I started out with a clean install of Debian Jessie (Full) on a 32GB SD card. After extracting the OS onto the card using Etcher I began by first configuring the wireless adapter I bought for it to allow me to work without being physically connected to my router. It’s an EDIMax EW-7811UN WiFi Adapter, and configuration was quite simple. wpa-psk PASSPHRASE #note this is not your password, it is the result of running wpa_passphrase SSID PWD at the command line! This tells the OS to ping my router every minute and to run the script every 5 minutes. With the wireless network now up, running and stable I wanted to configure my 4″ Waveshare Spotpear screen I bought for it so I could use that instead of carrying around a spare monitor. Sure I can SSH into the terminal from my laptop, but where’s the challenge in that? 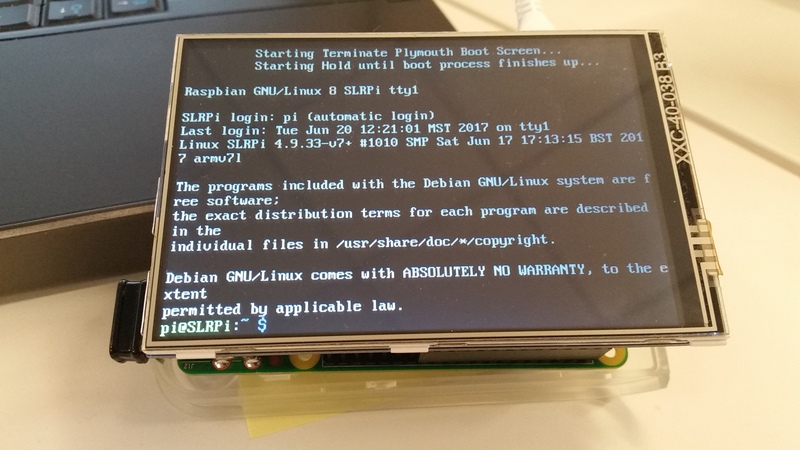 Setting up the LCD screen was a bit more complicated in versions of Debian prior to Jessie. It required downloading Waveshare’s Github repo (notro) and installing that, then configuring /etc/modules, /boot/cmdline.txt, /usr/share/X11/xorg.conf.d/99-fbturbo.conf, /boot/config.txt and /usr/share/X11/xorg.conf.d/99-calibration.conf. Thanks to the latest release of Debian Jessie this type of screen is accommodated as part of the OS! Installing the drivers was the only thing needed. Now, after a reboot the screen came up and I was able to have a truly portable dev environment! This pre-configures the BOINC client to basically run always. Note the cpu_usage_limit and suspend_cpu_usage values are set very high intentionally. If this were a PC I would be using for other purposes as well as for this activity I would adjust these accordingly. However, since this is the only thing this machine will be doing, I cranked them up to ensure it would always run. This has definitely been a learning process and I’m by no means done. If you have done this already and have suggestions or comments I welcome your feedback. Thank you for reading! 6/23/2017 Update: The previous change was in fact the correct answer, the screen has been up ever since setting that value! Now, on to the next challenge: having the client grab new tasks when the existing ones complete. The other GUI-based clients just grab new tasks automatically, you don’t have to do anything. For some reason the Linux command-line isn’t automatically getting new tasks. Once I figure it out I’ll post it here. If someone already has this answer please leave a comment! So far the screen has been up longer than 10 min, where it normally blanked out at 10 min. I’ll check back again tomorrow to see if it stays up. 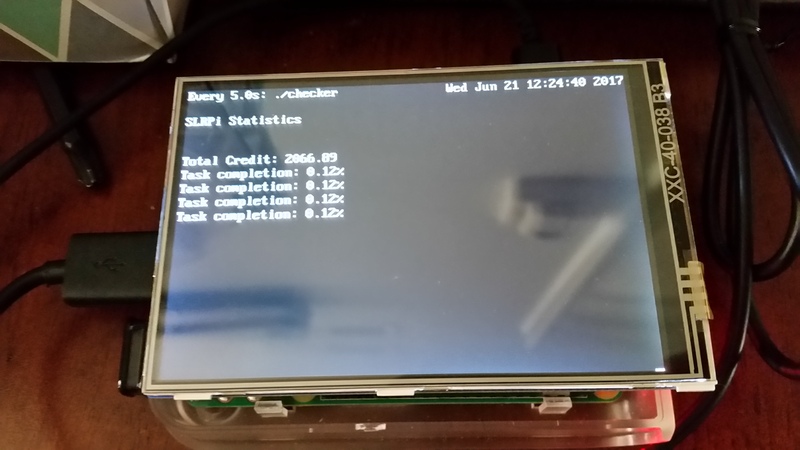 6/26/2017 Update: Unfortunately, it looks like installing the Linux x86 version of the BOINC client onto a Raspberry Pi isn’t going to work. The software is designed for an x86 architecture processor, and the Pi has an ARM proc. Reading up on the BOINC design itself, unless you’re running v8 for Windows/Android, or a customized version for other platforms it won’t get new tasks. This is a huge stumbling block for the RPi, but not something I’m unwilling to attempt to overcome! Meanwhile, I installed my same scripts and code onto a Linux box in Azure just to keep the code running, also to make sure my scripts are behaving. I’ll post here when I finish the modified ARM version of BOINC. 6/28/2017 Update: Well, good news! I read up on the forums on the SETI@Home website, and it looks like there are several builds for RPi already working. I had to register another account on their beta site and install another client app package from Debian, but I got it running again. Hopefully it’ll get new tasks this time, I’ll report back here after these tasks finish up whether or not it does work. That third install is the latest v8 build for Debian and contains the SETI@Home enhanced application. Installing this in combination with the others allows it to run and grab new tasks…so far. Then it was just a matter of updating my checker script to point to this new project URL and things are running well! 6/30/2017 Update: Today as existing tasks reached 90% completion it automatically grabbed 3 more! Success! Now to allow SLRPi time to process tasks from several radio telescopes and hopefully one of those will be an extra-terrestrial signal or communication of some kind.